・NEW! Chapter on ophthalmic surgical techniques describes instrument and suture choice, patient positioning, surgical preparation, and general techniques. ・NEW! Additional drawings depict ophthalmic surgeries. ・NEW! Suggested reading lists included at the end of each chapter. ・Clinical Tips boxes such as "The Controversy Remains", "Did You Know? ", "Look Again", and "Note" offer helpful practice advice and facts. ・UPDATED Additional species added to the exotics chapter include birds, small mammals, and others. ・A team of internationally respected veterinary ophthalmologists provide comprehensive, clinical expertise in all areas needed to evaluate, diagnose, manage, and monitor a patient with ophthalmic disease. ・Practical, clinically focused coverage provides a one-stop diagnostic guide to ophthalmic disease in small and large animals including dogs, cats, horses, livestock (cows, sheep, goats), birds, and exotic pets. 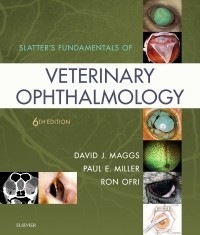 ・Chapters on equine, livestock, and exotic pet ophthalmology written by specialists in these fields for the most clinically relevant coverage.